Below are a few beaches we would all rather be at right about now. The more I look at some of these photos, the more inclined I am to remind myself that I am "retired" and I can relocate the headquarters of all of my ventures, businesses, and endeavors somewhere which has a beach and is warm all year long. 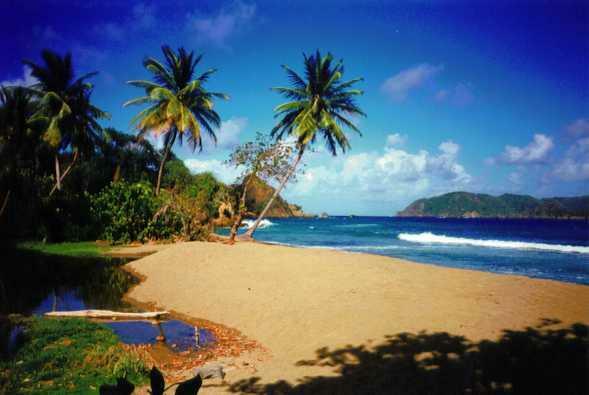 Tobago is the beautiful little sister of Trinidad, which lies windward, 32 km to the north-east of Venezuela and 250 km to the south of Barbados. There is only one description for it: luxuriant and unspoiled. It lies in complete harmony with white sand beaches, idyllic bays, clear-blue sea, crystal-clear water, colorful, unspoiled coral reefs, unique undersea world, waving palms and tropical rainforest.